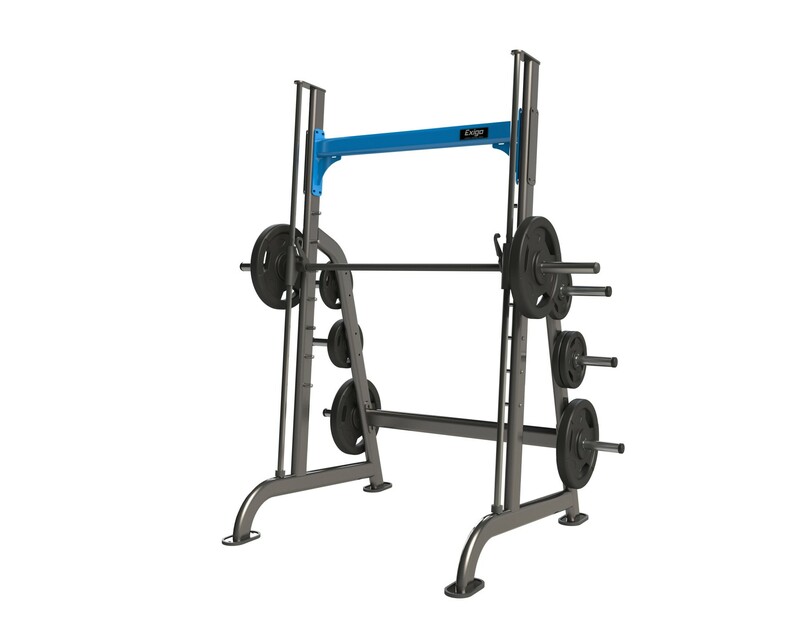 The Exigo Smith Machine is a superb machine that accommodates all users. Part of our industry leading plate loaded range. This machine features high head clearance and a clean walk through design. The stainless steel pins minimise wear and tear and the high quality 30mm linear bearings and chromed precision bar allow for smooth operation. Six Olympic weight horns are fitted as standard for convenient storage; useful for commercial gyms. In addition the frame work is angled at 5 degrees for a bio mechanically correct motion. Engineered with a heavy duty frame and premium components, our Smith Machine is ready to withstand a lifetime of intense workouts. Complete with a durable high quality epoxy powder coated finish. The Exigo Smith Machine is a must for any gym or training facility. Proudly designed and manufactured in our very own UK factory with a mainframe lifetime guarantee. Here at Exigo-UK, we pride ourselves on being able to offer a comprehensive variety of customisation options. Choose from one of our standard primary or secondary colours, or get the exact match you require from the many other colour options available on request. Our secondary colours offer a textured finish, which we recommend for increased grip on bars and grip points. All of our equipment is designed & manufactured in our UK factory, giving us complete control over our products. This allows us to engineer custom frame sizes and other requirements to fit your individual needs. Our team of expert in-house designers can produce a full 2D/3D concept gym design to bring all your ideas to life and help you to realise the full potential of your facility.